I tried out two types of macaron shells with the same eggnog filling: vanilla and cinnamon. For some reason, the cinnamon ones didn't rise up as well the vanilla ones. 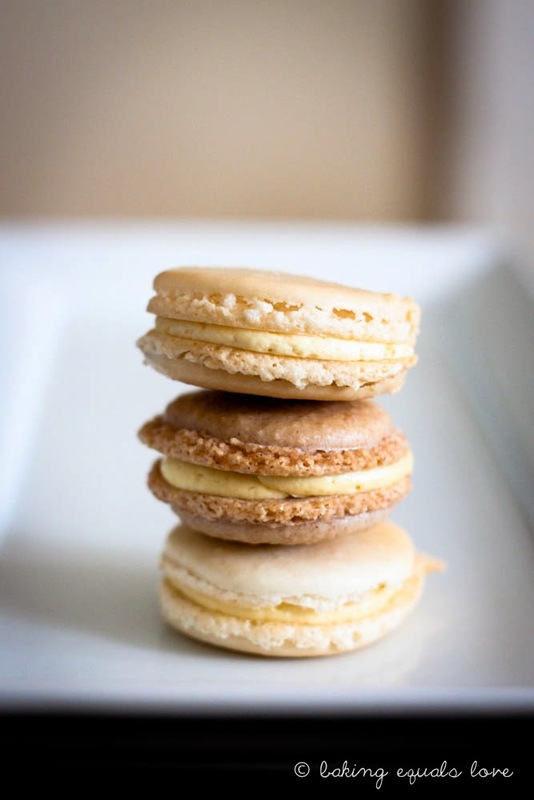 Could it be that the 2 tsp of cinnamon was all it took to upset the delicate macaron's sensibilities? 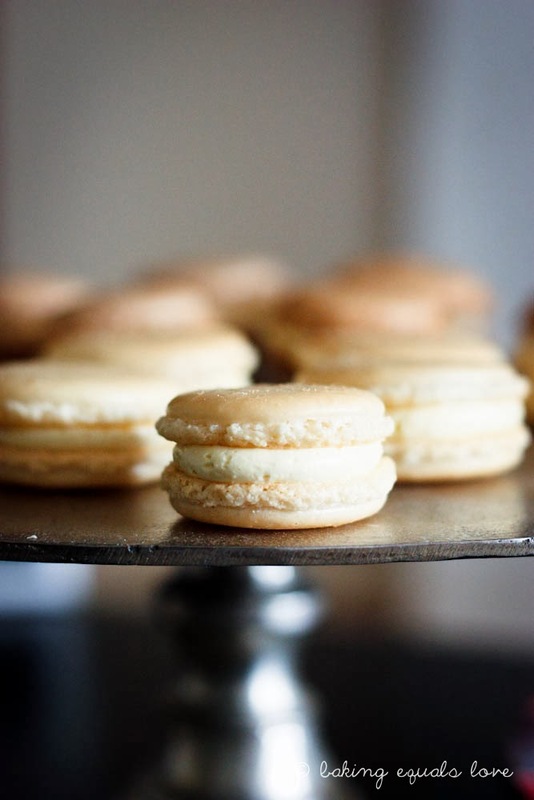 Swiss meringue buttercream is the perfect filling for these elegant little french cookies: both are delicate, subtle and oh so elegant. And team that with the spicy creamy eggnog and you get a macaron that tastes of White Christmases. Ok ok more like a boozy white Christmas next to the fire wearing your cuddly reindeer sweater and singing carols at the top of your lungs - the best kind of Christmas! 1. Age the eggs whites in a sealed container in the fridge for 24 - 48 hours or heat the eggwhites in microwave on medium-low for 10 seconds to mimic the aging process. Line 3 baking sheets with baking paper. The heavier weight the baking sheet the better. In food processor, blend together the icing sugar and ground almonds. 2. In a separate, immaculately clean bowl, beat the aged egg whites to soft floppy peaks. Then add the sugar very gradually, beating continuously, till it's shiny and glossy. 3. 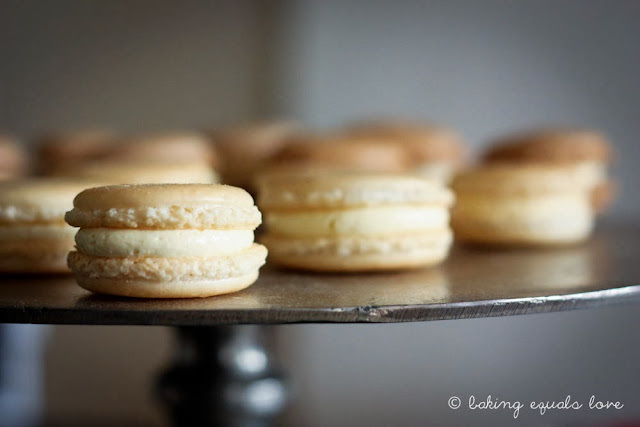 Macaronage: This part requires a adding up the strokes as you go so make sure you are in a zen place for this! Tip half the almond/icing sugar mixture into the egg whites. Very gently fold in for 10 strokes. Add the rest of the almond/icing sugar mixture and fold for another 20 strokes (i.e. 30 strokes in total). Add the vanilla. Now, this is a real tricky part to judge but the mixture is ready when it looks like molten lava - a slow blobby oozing consistency...this should take no more than around 40-50 folds in total. 4. Spoon the macaron mixture into a piping bag fitted with a round nozzle and pipe on to lined your cookie trays into roughly 1 inch circles, around 2 cm apart. Drop the trays on to the bench a couple of times to get the bubbles to come to the surface and pop them with a toothpick. 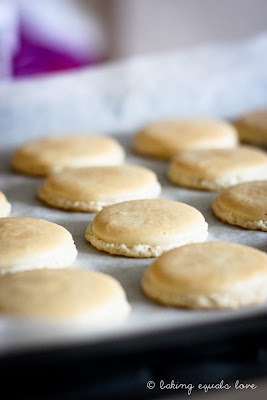 Leave the trays of piped cookies to air for 60-90 minutes for the shells to form skins (this step is crucial to get the highly sought after feet.) How long it takes will depend on how humid your place is. If it is really humid the skin might not form and you may not get feet - so fickle are these delicate little french things! 5. Preheat the oven to 150oC after the shells have formed. Bake for 11-12 minutes. Don't open the oven door before it's time! Cool completely on the tray before piping the buttercream in the middle and making into sandwiches. Put the filled macs into an airtight container in the fridge overnight to "mature" before eating. 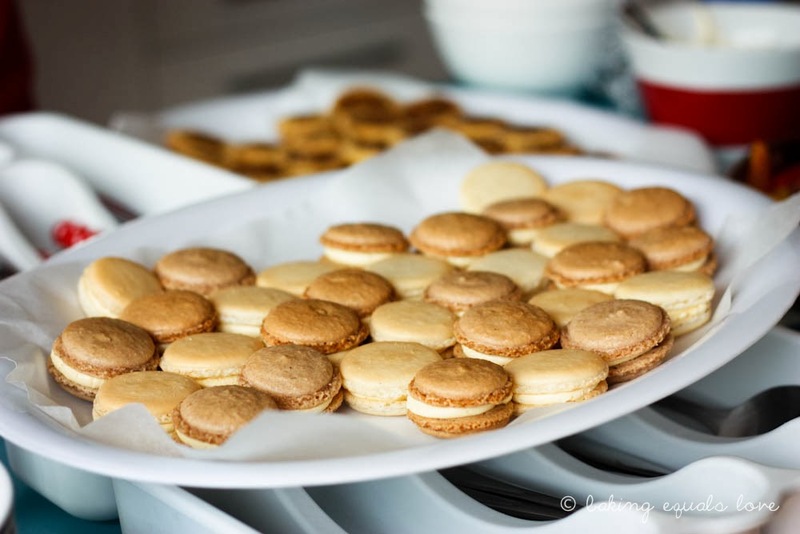 It is supposed to improve the flavour and allow the macarons to absorb some moisture from the filling to get the perfect chewy texture. I'm usually too impatient for that! For the cinnamon version, simply add 2 tsp cinnamon to the vanilla recipe. NB: I found the cinnamon versions didn't rise as well as the vanilla version! Not sure why. 3. Beat in the eggnog, brandy, and nutmeg. Pipe onto the maracons to make macaron sandwiches.